A Superb "Fruity Oolong Tea"
Summary : Wow...what else is there to say. 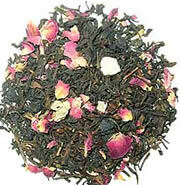 A oolong tea that has a nice, fruity yet smooth flavor to it. It's by far one of the best oolong teas I've ever had. If you've never tried an oolong tea before, head over to the Dragonwater Tea Company (now out of business) website and get this tea! Review : It's nearly 0 degrees outside, which is downright frigid weather here in normally warm and sunny Nevada. I mean...I left Montana to get rid of this type of weather, yet, as I have no luck...the weather has followed me down. Oh well, can't have everything, I guess. As it is January, and it is cold outside, I found myself in the mood for a "summer tea," or a tea that should help push away the winter blues...at least for a little while. And the first tea that said "summer" all over it was an oolong tea from the Dragonwater Tea Company (now out of business) called Oolong Passion Fruit. I love passion fruit...it's awesome fruity and sweet flavor. If there ever was a fruit that says SUMMER...it is indeed passion fruit. Here is the description of this tea as provided by the Dragonwater Tea Company (now out of business) : "Oolong Passion Fruit Tea. A soft Oolong tea blended with aronia berries, mango pieces, rose petals, and a passion fruit punch flavoring." To be honest, I've only been so-so on other Oolong teas. Particularly straight oolong teas...too many "straight" oolong teas taste too similar to a "straight" black tea for my liking. There are of course some exceptions, but by and large, I've come to prefer "infused oolong teas" over "straight oolong teas." Which is why, of course, I was quite optimistic about this particular passion fruit oolong tea. Besides having an absolutely terrific aroma straight out of the bag, the fruit pieces in this tea were huge! And large fruit pieces are always a darn good sign! Once brewed, this tea has a delightful flavor all its own. As one might expect, there is a moderately strong passion fruit flavor to it...making this tea pleasantly sweet. Additionally, the other fruit pieces in it enhance the "fruity" flavor you'll get. Even better, the tea lacks any sort of bitterness. Period. This tea simply glides right down...pleasing your tongue all the way. And the after-taste...well....let us just say you'll be rewarded with a nice, moderately sweet, fruity after-taste that will just linger and linger. Overall, if you've never tried an oolong tea before...GET this tea. This is especially true if you like other "fruity teas." About the only people that may be disappointed with this tea are oolong tea purists, or those that don't like "additions" to a tea. Due to all the fruit pieces and the passion punch flavoring that has been added...with this tea you'll find scant resemblence in flavor to more traditional "straight oolong teas." Recommendation : Absolutely. This oolong tea makes for a perfect introduction to healthy and tasty oolong teas. And if you like "fruit teas" in general...have no fear...you'll like this one. Just beware of the moderately sweet flavor to it. If you don't like "sweet teas," then this tea may not be for you. Brewing Instructions : Use 1 to 1.5 tablespoons of leaves. Pour 6-7 ounces of water heated to boiling. Let brew for 2-3 minutes.